Caring for your hardwood floors ensures they will stay beautiful for many years to come! Whether you’ve just put in your new hardwood floors or you recently moved into a home with hardwood flooring, you will need to know how to care for it. Caring for your hardwood floors is exceptionally easy, especially if you follow these 3 easy tips! No matter how well you, your family, and your guests think you’ve cleaned particulates off of your shoes before coming in, there’s always just a little bit left. Your shoes can track in all manner of things from the outside world that will damage your beautiful hardwood, including dirt, sand, salt, snow, and all sorts of other things. Especially in the colder seasons when there are all kinds of de-icing substances everywhere, it is important that people remove their shoes to protect the wood. Over time, the particulates and other things that are tracked in will wear down the finish and if it’s not caught in time it can really damage your flooring. If you prefer, you can always keep a pair of slippers or some “house shoes” by the door. Just as long as you’re not letting any footwear that has been outside on your floors inside, they should stay in good shape! Using a vacuum or dust mop of some kind to get rid of any dust before you mop your floor will make cleaning it much easier. If there is any dust on the floor, it will stick to the wet mop which will spread that dust all over the floor in yucky, wet clumps. If you remove the dust first, you don’t have to worry about re-distributing the dust and you can just enjoy your clean floors! Moisture is your hardwood flooring’s worst nightmare. However, accidents happen. When they do, you should make sure you clean up whatever has been spilled right away to avoid damage. 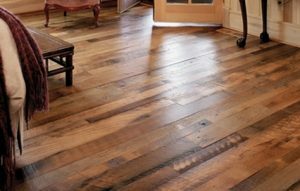 If the moisture gets into the wood, it can cause it to swell and no one wants a bumpy floor! Use a soft cloth and wipe up the spill starting from the outside of the puddle and working your way slowly inward. This way you can make sure you really are getting all of it up. This entry was posted on Friday, December 1st, 2017 at 3:33 pm. Both comments and pings are currently closed.